Pursue Your Dreams…Whatever They Are…Just Never Give Up! Anytime is the right time to read! … and whether it is in celebration of a particular event… such as Smashwords ‘Read an eBook’ Week or some other wonderful occasion, reading opens our minds, takes us places, calms the soul, stimulates our sense of adventure… all of that and more. March 1 – 7, 2015 is the official Smashwords ‘Read an eBook’ Week. So go to your favorite eBook outlet store, download an ebook … or two or three or more… and read! To find GREAT ebooks from Smashwords, Apple, and Barnes and Noble, for example, go to smashwords.com/ebookweek or simply click on the image below! There you can find out where and how to access books priced from free to … whatever! At Smashwords alone, there are over 50,000 free ebook titles to choose from! The best part about all of this is you don’t have to stop reading ebooks on March 7th! Not at all! Go find more great books… and just keep reading! My very first time participating in the National November Writing Month challenge, was so much fun! 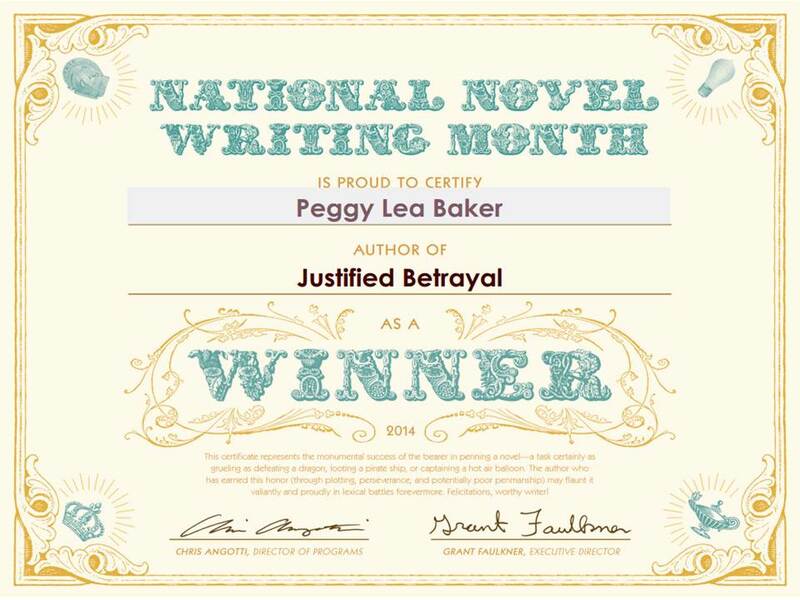 I was able to complete the 50,000+ word requirement in 22 days… very satisfying… and, as with all the other participating writers who met the challenge, I was awarded the NaNoWriMo Writing Challenge Winner Certificate. Not only do I intend to participate in future challenges, I realize I can produce a flash draft of a novel in a relatively short amount of time… a month even. My NaNo effort this time was to create a draft as a sequel to Unwitting Alliances, published September 2014. The working title is Justified Betrayal but it’s not finished. I will likely double the word count before my editor gets her hands on it! To create a flash-draft on a tight timeline is exhilarating! It proves you can do something when you put your mind to it. It provides an opportunity to produce a skeleton of a story. Within that skeleton you can begin to create interesting elements and characters quickly without worrying about a lot of details for now. It provokes a type of mental stimulation that stirs up those creative juices. Sometimes, during this challenge, I couldn’t write fast enough as ideas flowed easily and abundantly. At other times I’d just write stuff down to keep the story going and maintain an adequate pace to ensure I’d reach my goal. With excitement I submitted my 51,395 word draft for validation and received the WINNER! certificate for 2014. The beauty of this challenge is simple… you don’t need to wait for November to do it again and I won’t. I now have two drafts. The first one is a draft I wrote last May 2014, Relentless Obsession, as a sequel to Desperate Rescue. I challenged myself to test the feasibility of cranking out 50,000 in 30 days. In just about three weeks time I’d done it… just like this time. It is so doable! Do you love to write? Want to get a book out there? If you didn’t know about the NaNoWriMo challenge before, you do now. But don’t wait until next November! Make a personal challenge today… right this very minute. Pick a month… any month and write a 50,000 word book draft. Stick to it! Test the adventure! Besides, you’ll be better prepared for the National November Writing Month 2015 challenge… I know you can do this! So write on! The first book in the Hunter Blake Series, Unwitting Alliances hit electronic bookstores September 27, 2014 via Smashwords! If you are intrigued with private planes, helicopters, suspense, action, and a touch of romance, get acquainted with Hunter Blake, a successful actor and private pilot, who has suddenly become the target of an unknown organization seemingly intent on capturing or killing him. Now forced to take desperate steps to elude his pursuers and find answers to disturbing questions, he initially teams up with Janet Feldman (of Desperate Rescue) in an attempt to thwart his assailants’ sudden relentless and destructive measures. Unwitting Alliances reveals how seemingly trusted friendships and relationships can at times be manipulated to support another’s ulterior motive. It isn’t until the intent of some of those affiliations begins to unravel that the shocking truth becomes apparent. Deceit and corruption form the foundation of an organization with far-reaching implications, including the murder of some key players. Hunter, his dog Buster, and a handful of old and new-found friends must pull together, develop trust, and forge a new alliance to overcome the devious and corrupted plans of once trusted associates. Mix that with an unexpected reunion with someone from his past, Hunter comes to the realization that you may not always know a person’s true character – good or bad. Whatever the outcome he knows his life will never be the same.